Howtomakeadollar is not always the most ethical in our business practices and the claims we make. But that's okay, because we have an Official Fact Check Guy and an Official Accountant to keep us straight (i.e. take the blame for all of our unscrupulous business practices). If you are trying to be a good business person; however, howtomakeadollar feels it is important to sell a quality product. Selling a quality product is a better business practice than selling a poor quality product. Its true. Howtomakeadollar is proud to announce that we create quality products! We have a lot of people who hate us (you can see a list of them on the right column of our blog)... but we also have several people who like us because we produce a quality product. The quality product I am referring to is our custom laptop sleeve protector. 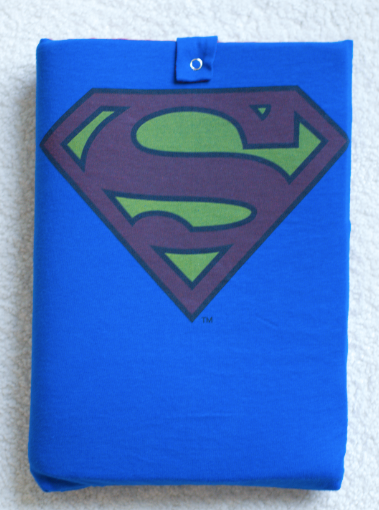 Specifically our superman laptop sleeve protectors. "It's AWESOME! Thanks." - Dustin B. "This product was made for my husband and he is a very hard man to shop for...he is all about functionality. I thought the Superman logo would be cute since he was a fan of the comics as a child. I gave him the gift when he started a new job and he really liked it. He uses it allll the time and has made comments about how perfect it is in size. I didn't know it at the time but he was planning on investing in an expensive one from a computer store. Now he has one with sentimental value and is also completely functional." -Leila H.
"Hands down the coolest think I have ever seen in my entire life!" -Andrew G.
So if you want to be successful selling a product, the key is to make a good product. If you would like to order your own super high quality custom laptop sleeve protector, email us and we will start on it as soon as possible. Please note that we currently have a slight backlog from all of our custom ipad sleeve protector orders that are coming in. But your order is extremely important to us and will be processed in the order it was received.